S I G N & D I G I T A L G R A P H I C S • August 2018 • 57 and do a lot of other wide-format com- mercial printing. We've also gotten into offset thermography as a specialty mar- ket, in addition to selling directly to the trade. We've really branched out and found new niches." Potential screen-printing adoptees should also consider the seasonality of their products—those spring and sum- mertime bursts of trade, lawn-care and contractor advertising, plus the short- term bursts of excitement during politi- cal campaigns—with some year-round opportunities in real estate. SDG market for inexpensive signage, using 4-millimeter corrugated plastic sub- strate and a website full of user-friendly templates to attract regional and national clients. Le says speed and ease of production are still the format's core advantages, allowing him to offer real estate or politi- cal campaign signs that are splashy but simple. 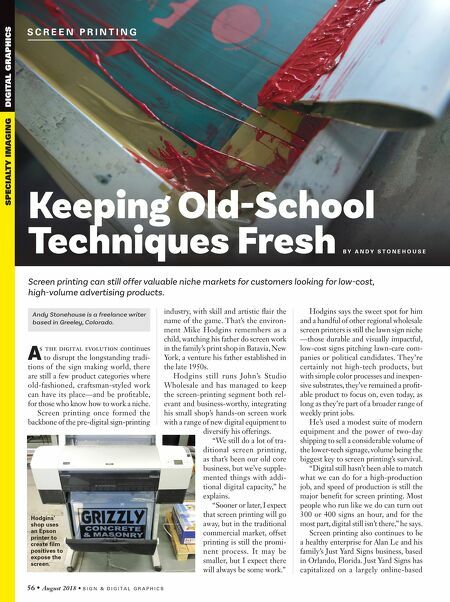 "Screen printing is faster, its ink is glossier, and the cost is less expensive if we do one-colored images—two-colored jobs cost more," he says. Digital printing, by comparison, produces matte finishes and tends to cost more, though prices all even out in three- or full-colored sign projects. Le says he works to keep Just Yard Signs' prices competitive and focuses largely on fast turnaround, with package specials and products that also include aluminum signs, car magnets and vinyl banners, produced on his wide-format equipment. 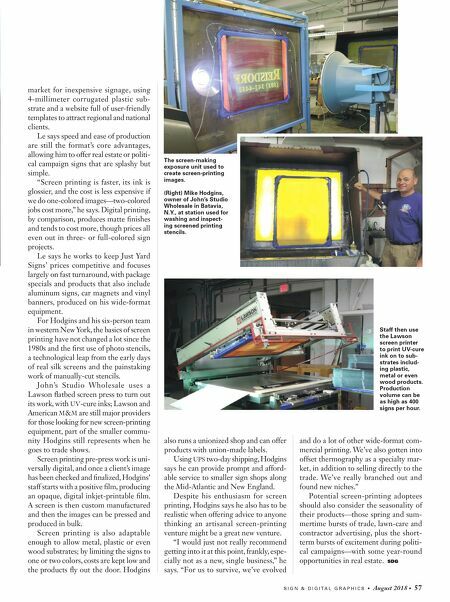 For Hodgins and his six-person team in western New York, the basics of screen printing have not changed a lot since the 1980s and the first use of photo stencils, a technological leap from the early days of real silk screens and the painstaking work of manually-cut stencils. John's Studio Wholesale uses a Lawson flatbed screen press to turn out its work, with UV-cure inks; Lawson and American M&M are still major providers for those looking for new screen-printing equipment, part of the smaller commu- nity Hodgins still represents when he goes to trade shows. Screen printing pre-press work is uni- versally digital, and once a client's image has been checked and finalized, Hodgins' staff starts with a positive film, producing an opaque, digital inkjet-printable film. A screen is then custom manufactured and then the images can be pressed and produced in bulk. Screen printing is also adaptable enough to allow metal, plastic or even wood substrates; by limiting the signs to one or two colors, costs are kept low and the products fly out the door. Hodgins also runs a unionized shop and can offer products with union-made labels. Using UPS two-day shipping, Hodgins says he can provide prompt and afford- able service to smaller sign shops along the Mid-Atlantic and New England. Despite his enthusiasm for screen printing, Hodgins says he also has to be realistic when offering advice to anyone thinking an artisanal screen-printing venture might be a great new venture. "I would just not really recommend getting into it at this point, frankly, espe- cially not as a new, single business," he says. "For us to survive, we've evolved The screen-making exposure unit used to create screen-printing images. (Right) Mike Hodgins, owner of John's Studio Wholesale in Batavia, N.Y., at station used for washing and inspect- ing screened printing stencils. Staff then use the Lawson screen printer to print UV-cure ink on to sub- strates includ- ing plastic, metal or even wood products. Production volume can be as high as 400 signs per hour.